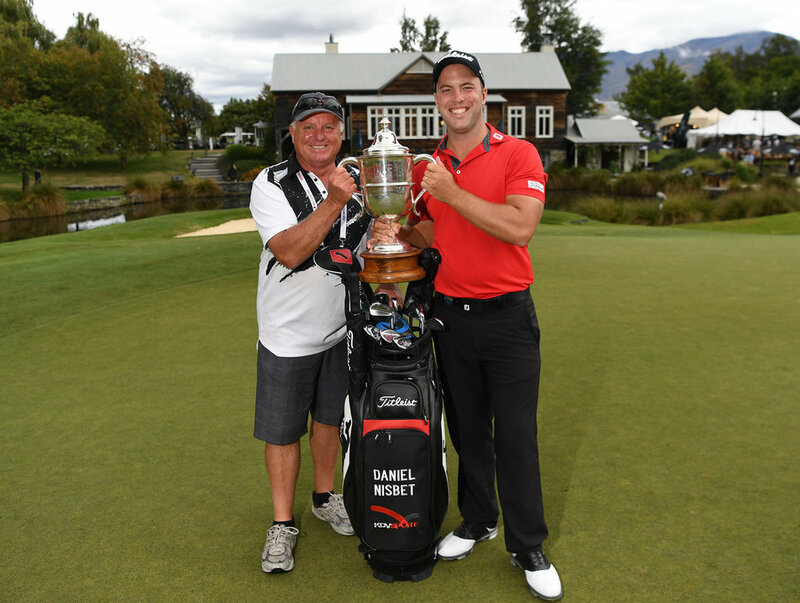 Last year’s New Zealand Open winner Daniel Nisbet and his caddy Tracy Tatom from Christchurch. More than 150 caddies are required for the 100th New Zealand Open. The tournament is being held at The Hills and Millbrook golf clubs in Queenstown from February 28-March 3. At last year’s event there were a number of caddies required for the final’s day play, either caddying for some of the professionals or assisting many of the amateur players. One of the volunteer caddies Tracy Tatom, from Christchurch Golf Club, had the experience of carrying the bag for the eventual winner, Daniel Nisbet. Tracy described it as an “incredible experience that I will never forget”. Needless to say, he will be on the bag again this year. With the format of 136 professional players and their amateur partners teeing off at The Hills and Millbrook on the Thursday, and then swapping courses on the Friday, approximately 150 caddies will be needed for the professional and amateur players. On the Friday evening, there will be a pro-am cut of the top 30 amateurs and the top 60 professionals (plus ties), who will go on to play at The Hills on the Saturday and Sunday. Caddies will need to confirm registration on site at The Hills driving range no later than Wednesday, February 27 by 10am. Most of the caddy jobs will be pre-assigned ahead of arriving at the golf course to reduce “waiting around’’ time. Caddies are paid a minimum of $100 plus a tip per round. There is a $39 cost to register as a caddy, and all caddies receive a New Zealand Open logoed golf shirt and cap to wear while caddying and to take home as a souvenir. Caddies should be social or serious golfers with a good level of fitness to carry the golf bag around The Hills and Millbrook golf courses. Many of the caddies have enjoyed going to the event with one of the highlights being the Steve Williams Caddy barbecue on the Wednesday evening. This is hosted by the tournament organisers and is an opportunity for the caddies to catch up with each other plus get some caddy tips from Steve Williams and his friends that stop by. To register, please visit the official New Zealand Open website nzopen.co.nz and click on the volunteers link for the caddy registration page. It is also recommended that you plan your travel and accommodation promptly. You won’t want to miss this 100th anniversary opportunity to caddy.